Friendswood Water Polo team. Back row (l-r): Coach John Little, Daniel Nagle, Vinnie Gangitano, Evan Metcalf, Thomas McHenry, Jacob Badough, Nick Jankowski, Peyton Davis, Noah Geno, and Coach Jeff Otten. Front row: Joe Sloan, Manager, Kyle Flick, Riley Tedford, Nick Calapan, Joey Alfonso, Adam Ertl, and Josh Haffelder (Photo by Cassie Nagle) . FRIENDSWOOD — The Friendswood Mustangs boys water polo team made history this season as they qualified for the state water polo tournament. No Friendswood team had ever advanced to state, but this year's squad set a new standard for others to achieve. 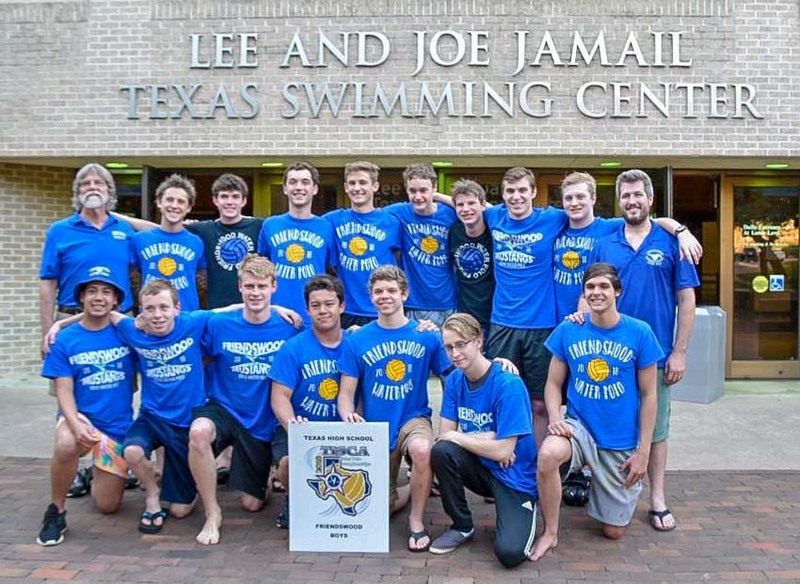 Friendswood was one of only 16 teams who qualified to compete for a state title in Austin. 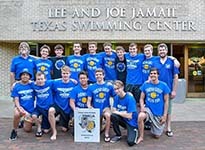 which was played at the Lee and Joe Jamail Swim Center on the University of Texas campus. "We are very proud of this group of athletes and this program," said FHS principal Mark Griffon, who traveled to Austin to support the team and is the biggest fan of Friendswood High School students. "They've put in long hours in the off-season, worked hard at practice, were dedicated to achieving their goals, and their efforts have paid off. "The FHS water polo teams have had success at the district and region level in the past; but this is the year they are competing at the state tournament." Flower Mound won the state championship with Denton Guyer finishing second and St. Mark's finishing third just in front of Friendswood who placed fourth in the state. "It has been the most exciting season of water polo I have ever been a part of," said Friendswood head swim coach John Little who will retire after this season. Leading the state honors was Friendswood head water polo coach Jeff Otten who was named "Coach of the Year." "What the men's team accomplished this season was not easy," said Otten. "The athletes put in multiple years of work to reach their goals. At region, they checked all the boxes; they played complete games and pushed themselves to new levels." Members of the Friendswood team include: Joey Alfonso, Jacob Badough, Nick Calapan (Captain), Parker Calkins, Peyton Davis, Adam Ertl, Kyle Flick, Vinnie Gangitano, Noah Geno, Josh Haffelder, Nick Jankowski, Thomas McHenry (Captain), Evan Metcalf, Daniel Nagle and Riley Tedford.